The rains this week were nothing compared to what we’ve handled the last couple of weeks. But you wouldn’t know in some parts of Loxahatchee. The flooding remains and the dirt roads are more like muck. What can be done? And who’s responsible for doing it? Neighbors dealing with the worst of the flooding are asking for change as local officials work to find a solution. Crews from the Indian Trail Improvement District were busy on Tuesday morning trying to get to as many work orders as possible. "We had about 75 of them on our answering machines this morning," said district manager Rob Robinson. Robinson and his team oversees 110 square miles of boundaries. "We have 40,000 residents. And 200 miles of dirt roads," he said. And he's very well aware of the flooding issues at Barky Pines Animal Rescue and beyond, first reported by WPTV last Friday and on Monday when the rainfall had inundated the area. Although Indian Trail oversees roads and canals in that area, they say they do not manage the canals causing the flooding. In fact, we learned no single entity is claiming responsibility for it. "It's like the wild west out there, as one neighbor explained it to me," said Robinson. "It's not within our legislative boundaries so I really can't expend any tax dollars out there." But Robinson spent hours out there on Tuesday, trying to get to see what can be done. "I'm trying to get my head wrapped around how their infrastructure works out there, so if it comes to us taking the lead out there -- we'll be in a better position to help those people out," he said. "They're all residents, they're all taxpayers. They all demand some satisfaction of what's going on out there -- I completely understand their plight." The roads are also concerning, with giant holes created in the dirt from the standing water and truck traffic. The rescue, along with several other properties in that area, is inaccessible without a high water or vehicle with four-wheel drive. 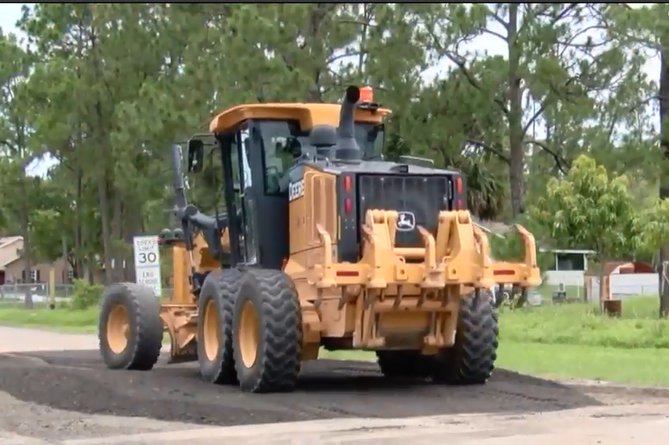 WPTV learned that many of the dirt roads are considered private, so there is no consistent maintenance other than residents plowing over the mud with their own homemade devices. If a road is managed, it varies between Indian Trail and the PBC public works. 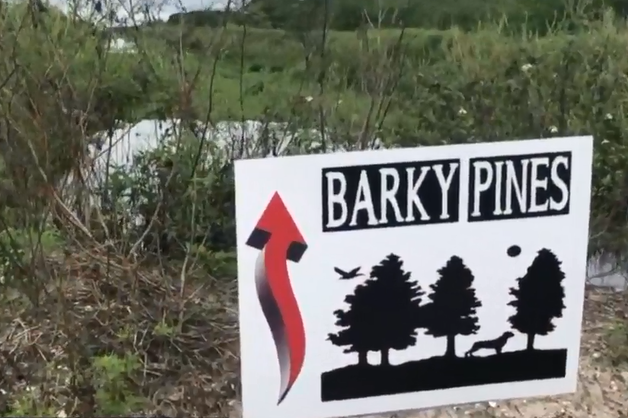 We visited Barky Pines' property again on Tuesday. The water hasn't gone down much at all from our visit on Monday, with some areas still as deep as four feet on the property. "We're just waiting on the water to recede," said rescue founder Elizabeth Accomando. She said she is happy to finally see some response. "It's been quite amazing," she said. "[Indian Trail] is just trying to help us get to the bottom of where do we go to, who do we reach out to and maybe act as a liaison." County commissioner Melissa McKinlay's office -- whose district includes that area -- stopped by Barky Pines with some good news and a show of support. Her office is taking part in a meeting -- which is being organized by Indian Trail -- to discuss what can be done about the canals. "Trying to get all the stakeholders together at one table so that we can come up with a solution out there for the people at Santa Rosa Groves," said Robinson. That meeting is already being planned for sometime in mid-June. Indian Trail, the county, developers, the local HOA and other stakeholders will take part in the meeting. "That is a huge step in the right direction, I mean that is just amazing. I can't tell you how grateful I am for that," said Accomando. "We're going to need a long term solution how we can all work together as neighbors, without anybody being adversely affected."